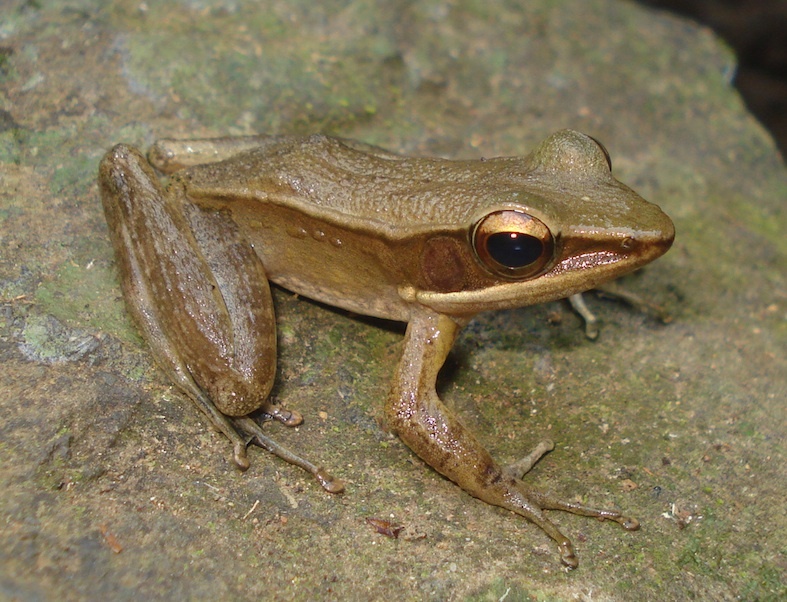 ​We are working on the systematics and biogeography of several genera of frogs and lizards in the Western Ghats. Our work has focussed on discerning the relative influence of geology, historical climate and environmental gradients on diversification, diversity and endemism. We employ a comprehensive field sampling approach taking into account the heterogenous landscape and ecology of the Western Ghats. We identified major hill ranges in the Western Ghats and divided them into different sampling blocks. We also stratified the elevation gradient such that sampling sites could be selected in low, medium, high, and montane habitats in each hill range. This allows us to identify sister lineages with confidence which is critical for further inferences. Using a combination of conventional morphometrics, phylogenetic analysis and distribution modelling, we draw inferences about modes of speciation and drivers of diversification. Over the last eight years, several students and researchers have been involved in projects on the diversification of frogs and lizards in the Western Ghats. While his own PhD focussed on bush frogs as a model system, ​SP Vijayakumar has in general been the architect of our work on historical biogeography. KP Dinesh has been our taxonomic expert and assisted with several systematic efforts. Varun Torsekar is currently completing his PhD on Nyctibatrachus. Led by Saunak Pal and Deepak V, we are also currently carrying out a systematic revision of Calotes in India. Various others - SR Chandramouli, Mrugank Prabhu, Vijay Ramesh, Kalpana Das - have contributed to our work on one or more taxonomic group. Chaitra set up the molecular lab and seeded many evolutionary ideas. His successors, Riya Menezes and Aditi Jayarajan, ensured that lab work went on smoothly (despite the efforts of field biologists). Alternative models of diversification in Western Ghats frogs, 2009-2012, Council for Scientific and Industrial Research (CSIR), (S.P. Vijayakumar). Addressing the ‘Wallacean Shortfall’ for small vertebrates in the Western Ghats across space and time, 2009-2013, Critical Ecosystem Partnership Fund (CEPF). (S.P. Vijayakumar). Diversification and speciation in the stream dwelling frog genus Nyctibatrachus from the Western Ghats, India, 2012-2013, Herpetological Conservation and Research Fund, (Varun Torsekar). We have been working on the diversification of snakes, including questions relating to the dispersal of selected taxa into and out of India. 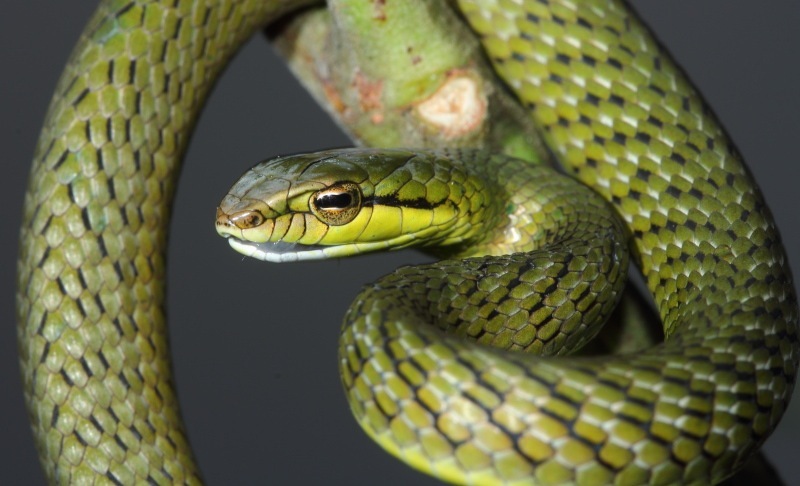 Ashok Mallik's PhD has focussed on viperids and colubrids, and he has extensive sampling from the Western Ghats, Eastern Ghats and Northeast India for pit vipers (Trimeresurus), vine snakes (Ahaetulla), cat snakes (Boiga) and a few other genera. He is currently working on the systematics of these taxa, as well as their diversification in peninsular India. In addition, Ashwini Mohan carried out a study for her Masters dissertation on the phylogeography of the Andaman keelback, exploring the effect of saltwater and other barriers on gene flow between populations. ​Patterns of distribution and diversification in select snake genera in the Western Ghats and Northeast India, 2011-2014, Department of Biotechnology (DBT), (Ashok Kumar Mallik). 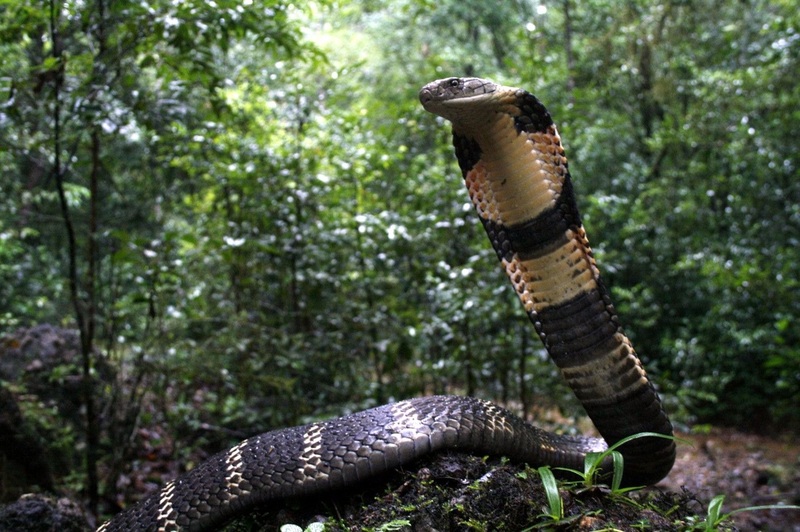 We are working on the biogeography and systematics of king cobras in collaboration with Wolfgang Wuster (Bangor University, Wales), Indraneil Das (University of Malaysia, Sarawak), Rom Whitaker and P. Gowri Shanker. Under the supervision of Jacob Hoglund (Uppsala University, Sweden) and Sushil Dutta (North Orissa University), Gowri is focussing on the phylogeography of king cobras in India for his PhD. and is currently in the process of collecting samples from across the country. In collaboration with SP Vijayakumar, we intend to initiate work on the biogeography of other venomous snakes in the near future. This work will dovetail with research on venom proteomics and anti-venom production that is being carried out by other collaborators. We are interested in understanding the factors that influence genetic diversity within populations of a species through the process of dispersal. Broadly, there are two main external factors that influence successful dispersal - how patterns of ocean currents help in moving animals, and how habitat distribution influences survival of dispersers. Apart from these, there are internal factors - species life-history traits that can influence dispersal and population connectivity. DK Bharti is studying gastropods, using molecular tools to measure genetic connectivity between populations spread across the west coast of India. She is focussing on two important groups of marine snails‐ the sub‐family Littorininae which occur in rocky shores and mangrove intertidal habitats, and the family Conidae, which occur in sub‐tidal habitats. The results will help us understand biogeographic patterns in this region, compare the importance of different factors for dispersal, and help delineate populations which may be of commercial importance and localities which might be of conservation importance. We have been working on the phylogeography of olive ridley turtles on the east and west coasts of India. Our earlier research on ridleys on the east coast of India (in collaboration with Wildlife Institute of India and Centre for Cellular and Molecular Biology) showed that ridleys on the east coast of India are ancestral to global populations of olive ridleys, and recolonised the Pacific and Atlantic basins after the extirpation of populations there. The results also showed that populations across the east coast, from Orissa to Chennai, did not differ from each other. Intriguingly, they did differ to some degree from the population in Sri Lanka. We are currently comparing populations on the east and west coasts, as well as in the Andaman Islands. We are supporting Martin Stelfox (Olive Ridley Project, Maldives) in his work on the genetics of olive ridleys in the Western Indian Ocean. We are also working on the genetics of leatherback populations in the Andaman and Nicobar Islands. We plan to initiate work on the foraging populations of green turtles in the Lakshadweep Islands. Shanker, K., B.C. Choudhury and RK. Aggarwal. 2011. Conservation genetics of marine turtles on the mainland coast of India and offshore islands. Final Project Report. Wildlife Institute of India, Dehradun and Centre for Cellular and Molecular Biology, Hyderabad.